William Henneberry (c. 1825 Galbally, Ireland) Sept. 16, 1877. Arrived in New York on June 17, 1848 aboard the Argyle with his parents David and Jane Henebry and other members of the Henneberry family. Was residing in Braceville Township in Grundy County, IL from the 1850 census records. He married Mary Hayes in 1849. Mary was born in 1829 in Ireland and could have been the sister or cousin of Dennis Hayes who married William's sister Elizabeth. The name was spelled Henebry in the 1850 census, Heneberry in the 1870 census, Henneberry in the 1880 census and Hennebry in the 1900 census. In 1850, William and his wife Mary Hayes and daughter Jane (born Sep. 1850 in Braceville), were living on the same farm or next door to his mother, Jane Henebry and most of her children. On November 1, 1856 became a citizen taking the oath in Grundy Co. James and Michael Henneberry were sponsors. In the 1860 and 1870 census, William was living in Reed Township in Will County, IL. In 1864, William discovered the first coal deposits in Will County. He was attempting to drill for water and while drilling past 80 feet discovered coal (Woodruff's, Will County History and Illinois Guide & Gazetteer, Rand McNally & Co. 1969 page 87). William is said to have purchased the land from the government at $1.50 an acre and later sold it for $4.00 an acre. The land was later sold to a coal company for $150 an acre. Margaret: married John Uppendahl on June 26, 1877 in Cook County, license # 314494. Catherine (Katie): married Thomas O'Brien on Sep 25, 1881 in Cook County. Jane: b. Sep. 1850 never married? The 1900 census for Braidwood, Will County, ED 144, Line 27 shows David, Jane age 51 and a brother, Walter (Michael) in the same household. Wilmington Advocate dated September 21, 1877: Died in Reed on the 16th last, of cholera, morbus, William Hennebery, aged 30 years. The deceased was a native of Galbally, County Limerick, Ireland and emigrated to this country in 1849. He leaves a widow and six children to mourn their irreparable loss. Note: The above obituary is for the William married to Mary Hayes and the age should be 50 years old. Further Confusion. Aboard the Argyle were TWO William Henebry's. One was the son of David and Jane, and the other was the nephew of David. They were both the same age-23. From the Grundy County Plat Book of 1876: William Hennebry owned 80 acres in Goose Lake Township. This may be the same William who was the son of David or might be the William who was the brother or cousin of David. In the 1870 census for Felix Township, Grundy County, William and Johannah and children were living next to Elizabeth and her husband Dennis Hayes and their children. On adjacent farms were James, Patrick and David Henebry and James Cushing, his wife Bridget age 40 and one child age 13. The 1870 census lists ages: William age 40, David age 38, James age 36, Patrick age 30 and James Cushing age 40. William was born about 1825 in Glen Aherlow, County Tipperary, Ireland. William was the nephew of David Henneberry and came to America with other family members aboard the Argyle June 17, 1848. He died April 12, 1893 in Wesley Township, Will County, Illinois. It is believed that William was the son of James and Elizabeth Henneberry. James was the brother of David. William married Johannah Cooper in 1854 in Wilmington, IL. Johannah was born about 1833 in County Tipperary and died June 21, 1914 in Wesley Township, Will County, IL. They are both buried in Mt. Olivet Cemetery in Wilmington. William Henneberry age 48, Johannah age 46; Thomas age 22; Jane age 20; Mary age 18; William age 16; Margaret age 15; Patrick age 12; Julia age 11; Johannah age 9; Michael age 8; Ella age 5; John age 2. 1920 Will Co. H516. 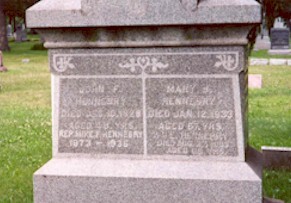 Patrick Hennebry age 47; brother William age 50; brother John F. age 40, Mary, sister age 52. Margaret age 46 and Michael F. were living at the same address. All born in IL. Eleven children born in Grundy County: None of the children married. Thomas: Oct. 14, 1858-Nov. 28, 1945. James: 1864-Feb. 10, 1902. Mary J.: 1865-Jan. 12, 1933. William: 1866-Aug. 27, 1933. Margaret A.: Sep. 2, 1867-March 5, 1953. Patrick: Oct. 3, 1869-Feb. 17, 1953. Julia: Sep. 8, 1872-Oct. 4, 1943. Johannah: 1871-June 15, 1909. Michael F: March 14, 1873-May 12, 1836. Ella (Nellie) 1877-Dec. 31, 1896. William: died April 12, 1893, age 68. Nellie: died Dec. 31, 1896, age 19. Johanna: died June 21, 1914, age 81. Julia: April 19, 1873 - Feb. 24, 1904. James: died Feb. 10, 1892, age 38 Hannah: died June 15, 1909. John F. died Dec. 10, 1928, age 48. Mary J. died Jan. 12, 1933, age 67. John F., Mike F., Mary J., Wm E.
Wilmington Advocate, Wilmington, IL Friday, March 27, 1936. "Michael F. Hennebry, a former resident of Wilmington, is a candidate for Representative in the General Assembly on the Democratic ticket. Mr. Hennebry has been a member of the Legislature, now completing his twelfth term in the House of Representatives, and his long experience and his wide acquaintance throughout the district enables him to meet the duties and responsibilities of this high and responsible office and to possess an intimate knowledge of the needs of the people. Mr. Hennebry as a member of the legislature has been of great help to the people of Wilmington during his years of service and the people of this community have been greatly benefited in many ways by his influence in Springfield and the Democratic primary voters again have the opportunity to register their approval of his service to them by voting for him at the primary electorate on Tuesday, April 14. 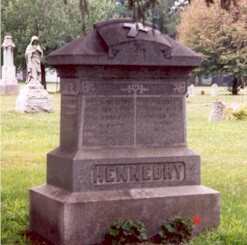 If re-nominated at this primary and re-elected in the fall election, his pledge and promise to the people of this community where he has spent the greatest years of his life, will be to give to them his very best efforts and to continue the faithful service to his people to any all matters of interest to them"
"Michael F. Hennebry, engaged in the practice of law at Wilmington, where for six years he has served as city attorney, while his specialty in private practice has been in probate work, was born in Felix township, Grundy county, Illinois, on the 14th of March, 1872. His parents were William and Johannah (Cooper) Heunebry, who were pioneer residents of Will county, locating within its borders in 1848. They took up their abode at Aitens, now Lemont, and the father followed the occupation of farming. They were both natives of County Tipperary, Ireland, and the father, who was born in Glen Arlagh, died in Wesley township, Will county, Illinois, on the 12th of April, 1893. The mother still survives, being a resident of Wilmington, in her seventy-fourth year. They were married in Wilmington in 1854 and remained residents of that place until the early '6Os, when they removed to Grundy county, Illinois, settling on what was known as the old Shoemaker farm. In 1879 Mr. Hennebry made his first purchase of land, becoming owner of a tract of one hundred and sixty acres about three miles east of the village of Mazon, Grundy county. They removed to Will county in 1888 and purchased what is known as the old Elnathan Jones farm in Wesley township, for which they paid twenty thousand dollars. Mr. Hennebry started on his business career without capital and became one of the leading agriculturists of Will county, owning valuable property interests, from which he annually derived a good income. He never cared for public office, although he was a stanch advocate of democratic principles. In his family were eleven children, of whom eight are now living: Thomas, Mary, Margaret, William, Patrick, Hannah, Michael and John. The first named is a resident of California. Michael F. Hennebry spent the days of his boyhood and youth under the parental roof and, having acquired his preliminary education, continued his studies in Notre Dame University in Indiana, pursuing commercial, English and law courses. He was graduated from the law department in the class of 1897. He had lived and worked upon the home farm until he reached the age of twenty years and in his youth his time was largely occupied with the duties of the fields, his opportunity of attending school being limited to the winter term. He early developed a strong desire for a professional career and when his fathers financial resources permitted he was sent to more advanced schools, thus preparing for the walk of life upon which he entered following his graduation. He opened a law office in Wilmington and in his practice has largely made a specialty of probate work. He is also interested with his brothers in the farm in Wesley township, to which his parents removed in 1890. He has been city attorney of Wilmington for six years, proving a capable and efficient officer, and in the trial of causes entrusted to his care by reason of his office he has displayed a comprehensive knowledge of the law and unfaltering fidelity to duty. Mr. Hennebry is greatly interested in the political situation and the questions which divide the two great parties. He votes with the democracy and was elected a member of the house of representatives, serving in the general assembly in the session of 1899. He was defeated for a second term through a mistake in the counting of the ballots under the old cumulative system of voting. Mr. Hennebry is a member of the Joliet council of the Knights of Columbus, which he joined in 1899, and he also belongs to River camp, No. 124, M. W. A., with which he has affiliated since 1896. In 1901 he became a member of Wilmington district court, No. 196, of the Court of Honor. He is a Catholic in religious faith, being a communicant of St. Rose of Lima at Wilmington. The predilection which he manifested at an early age for a professional career seems to have had a good basis in his natural tendencies and abilities, for in the profession which, he has chosen as a life work he has won substantial success, being regarded as one of the strong and able members of the Will county bar." January 1, 1897: "Miss Nellie Hennebry, sister of Attorney M. F. Hennebry, after an illness of several weeks died at the home of her sister on Water street yesterday afternoon, aged 17 years. The young lady had attended school in this city where she was a general favorite." Feb. 26, 1904: "The remains of Miss Julia Hennebry who died in Phoenix, Arizona on Thursday last, will arrive here on Monday next. The remains will be taken to her former home in Wesley. The funeral will occur Thursday, March 1st at St. Rose's Church, this city at 10 AM. The remains are accompanied by Patrick Hennebry, a brother." June 18, 1909: "We desire to return our sincere and heartfelt thanks to all of our friends and neighbors for their many acts of kindness shown and extended to us in the last illness and death of our dear daughter and sister Hannah. Mr. William Hennebry and Family." May 1936: "Michael F. Hennebry, 63 years old, veteran Democratic legislator and Will county representative in the general assembly for the past 24 years, died suddenly Tuesday afternoon at the St. Joseph health resort at Wedron, Illinois. An embolism caused has death abortly after 1:15 o'clock. Mr. Hennebry, renominated in the spring primaries for representative from the 4th senatorial district had gone to the health resort last Friday for a short rest. The veteran legislator suffered the heart attack shortly after having lunch in his room at the health resort. his nurse, returning to room after removing the luncheon tray saw him slump forward in bed. The nurse hurriedly summoned Dr. Raymond J. Kennedy of Joliet, who has been at the sanitarium for the past few days and Dr. George Klumpber house physician. The two physicians worked over Mr. Hennebry for half an hour: Attempts to revive him failed. Mr. Hennebry's health had not been particularly impaired over the past several months. He waged and energetic campaign in the spring primaries, and had not appeared to over tax his strength. His is survived by one brother, Patrick, and a sister, Margaret, both of whom lived with Mr. Hennebry at the home at 201 Whitter avenue, Joliet. The oldest member in point of service on the Democratic side of the house, Mr. Hennebry was completing his 12th tern as representative from the 41st district. He had served continuously from 1912 and was dean of the house majority. Born in Grundy County, March 14, 1873, he received his elementary education in the district and Wilmington high school. He graduated from the University of Notre Dame with an LL.B degree in 1895 and was admitted to the bar the following year, specializing in probate court practice. He was a member of a family of 11 children, six boys and five girls, none of whom were ever married. His parents were the late Mr. and Mrs. William Hennebry. Mr. Hennebry had lived in Joliet for the past two years. Prior to that he had lived in Wilmington, where he had begun his law practice. Besides his service at Springfield, Mr. Hennebry held other public offices as member of the board of education at Wilmington and as Wilmington city attorney. He was a member of many fraternal organizations. Active pallbearers were Thomas Hayden and Joseph Hennebry, nephews....."